My Life Group (small group from our congregation that gather weekly) has started a daily challenge: Each morning, share a Scripture to encourage the others. It’s been fun getting the group texts each morning as I arise. I find myself taking note of Scriptures throughout the day to find one to share the next morning. It has been encouraging; I’m glad the Holy Spirit guides me and brings things to remembrance! Lately, I’ve been in several meetings (not just my Life Group) where I got a bit impatient. People tend to want to share blow by blow accounts of their trials, frustrations, offenses and such. An hour and a half meeting can easily turn into 2 hours or more. I wonder what would happen if we shared short, succinct needs, then went right to prayer instead of sharing things that probably glorify evil? If we take Apostle Paul seriously and “pray continuously”, we could have an open line of communication with God in a meeting as things come up, rather than saving all the prayer time ’till the end. If you leave the prayers to the end, the sharing can leave you no time for praying together before people leave the meeting due to time constraints. It brings to mind Philippians chapter 4 where we are told to (1) rejoice in all situations (2) don’t be anxious about anything,(3) in everything present prayers & petitions to God, (4) with thanksgiving. then (5) things we should think about. Sandwiched between these instructions, Philippians 4:7 promises the reward for doing these 5 things: and the peace of God, which surpasses all understanding, will guard your hearts and minds through Christ Jesus. On another note; I was offered a chance to go to Kenya with a work team for two weeks in January. Here are my pro/con musings. Pro: since I went to Haiti 4 years ago, I have most of the immunizations; malaria pills not needed since the work is in mountains where mosquitoes don’t congregate. I have a current passport and can apply for a visa for $50.00 on-line, getting it by email, no need to wait for mail. I have about $1,400.00 in savings put aside for a trip like this and I have basic’helper’skills that would aid the men from our church who are gathering to go on this trip to lead the building work. Con: I’m told I won’t be able to donate blood (I enjoy donating regularly) for 2-3 years after visiting Africa (but if I’m going to get a tattoo, this would be the time!). My husband’s still working on the house we’re going to sell making my traveling at this time a disadvantage to him. Planning for this trip should have begun about July and now it’s November. My summer job ended and not much time to fund raise. Pro: God provides all our needs if He asks us to go! I awoke in the wee hours, going over these things with the Spirit, coming to the decision I’d ask my husband about going at breakfast. Well, hubby told me we needed to talk first thing, before he got busy for the day. He’d just paid several bills & taxes and the reserve funds from his retirement we’d been using to remodel the house are depleted. He put us on an “austerity” budget until our house sells and can’t give me the monthly “stipend” he’s been supplying, which means I’ll have to fund my monthly giving, gas and other personal needs from my savings. So,I immediately decided not to mention the trip to him. Am I being a wise, prudent wife? OR am I fearing man and not trusting God? I will continue to seek wise council and ask the Lord to show me what to do. 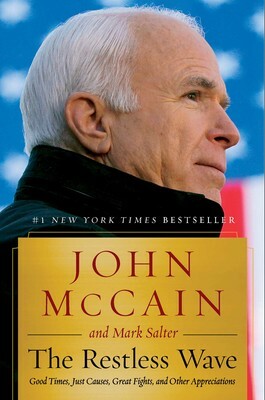 I’m reading The Restless Wave; the last book John McCain wrote before he died. Very interesting what’s been going on behind the scenes between our country and the foreign events. I never realized we have Senators that travel abroad to war-ravaged areas or how much interaction Senators like McCain have with heads of state of other countries. It’s interesting hearing what someone who actually worked with President Obama, VP Joe Biden, Hillary Clinton, etc. thought of these people. John believed every person has value, even if he didn’t share their views. He wasn’t a perfect man, but he honored God and did what he could to honor our country and its leaders (As did King David). If you want a balanced perspective of the immigration issue from someone who lived in a border state or a true estimate of Putin’s “follies” and other world events, this is the book to read. Previous postI will fear no evil? Amen! God provides all of our needs. I pray that you continue to pray and that God would guide you in this matter.